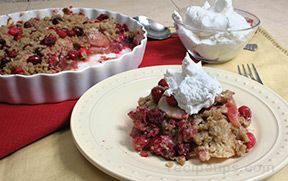 This showstopper marries mellow golden pears with tart 'n tangy cranberries, and topped with a sweet and spicy crumble of brown sugar, cinnamon and allspice. 1. Preheat oven to 375° F. Prepare pie crust as directed on package for one-crust pie using 9-inch pie plate. 2. Mix granulated sugar, cornstarch, 1/2 teaspoon of the cinnamon and 1/8 teaspoon of the allspice in large bowl. 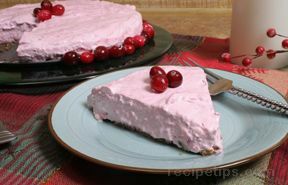 Add pears and cranberries; toss to coat well. Spoon evenly into crust. 3. Mix flour, brown sugar, remaining 1/2 teaspoon cinnamon and 1/8 teaspoon allspice in small bowl. Cut in butter until coarse crumbs form. Sprinkle evenly over fruit in crust. Place pie on large baking sheet. 4. Bake 1 hour or until pears are tender and topping is lightly browned. Cool on wire rack.Test Kitchen Tip: For best results, use firm, ripe pears that just yield to gentle pressure. 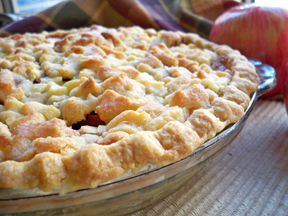 Apple and Cranberry Crumble Pie: Prepare as directed. Use 6 apples, cored, peeled and sliced, in place of the pears.